This unusual, carefully restored vehicle carried almost everything except revenue passengers. It was the first piece of rolling stock acquired by PSRMA, and the first to arrive at its Campo Facility. Based on Fairmont's A-6 Model 2330 utility railcoach, this Class A2332A Railbus was builder's #137425. 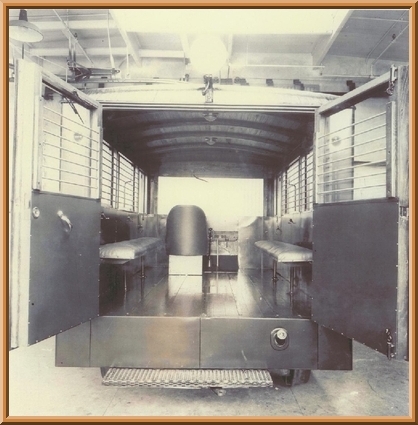 The 20-gage steel body with wood interior & canvas arch roof was built by Eckland Brothers of Minneapolis. It's 15' long, weighs 6,000 lbs. (3 tons), has a 94 1/2" wheelbase, Ringseald-Bower axle bearings, four demountable 20" wheels with iron-shoe self-centering brakes, and six coil springs, two above the front axle and four above the rear axle. It has a 4-cylinder 40 hp Ford Model A gasoline engine, and a Ford AA truck transmission with Fairmont Reverse gearbox, providing four forward & four reverse speeds. The car has two side doors and a rear one, hand-operated windshield wiper, a center-mounted jack on which it can be raised and turned around, one rear and two front headlights, interior & marker lights, and a vinyl bucket seat for the operator. 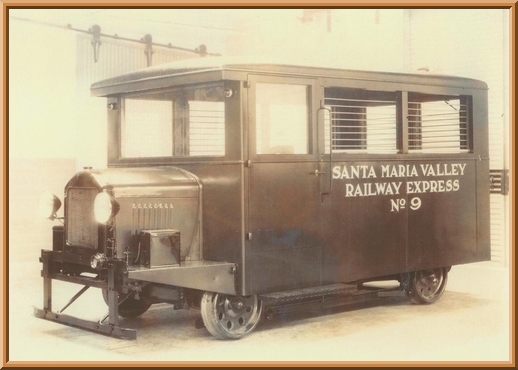 Although designed to carry twelve people on two 6-seat padded side benches, the car was purchased mainly for mail and express service by the Santa Maria Valley Railway, which numbered it SMV #9. 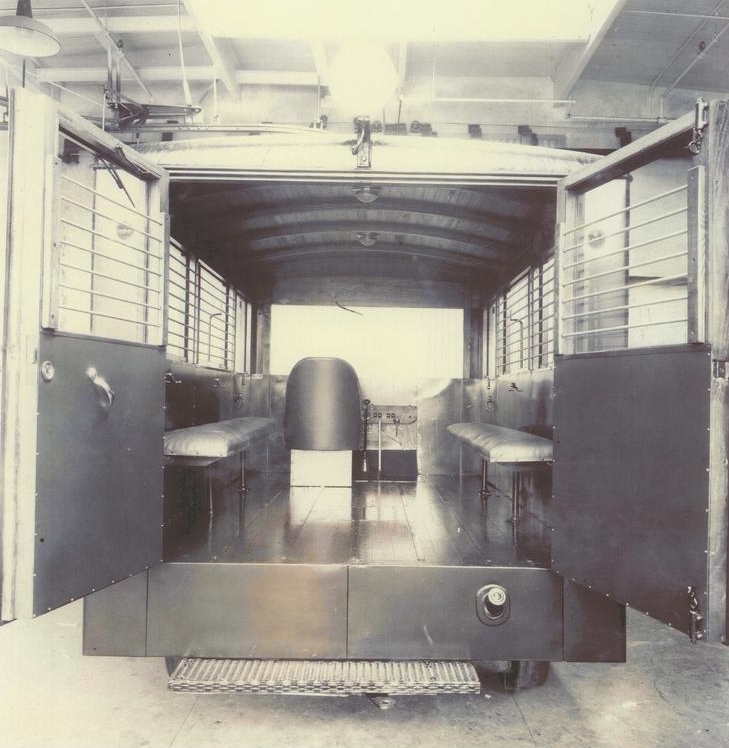 An iron safe was placed in the car, which was so heavy that if not in the center when the car was turned on its jackscrew, the car might topple over! 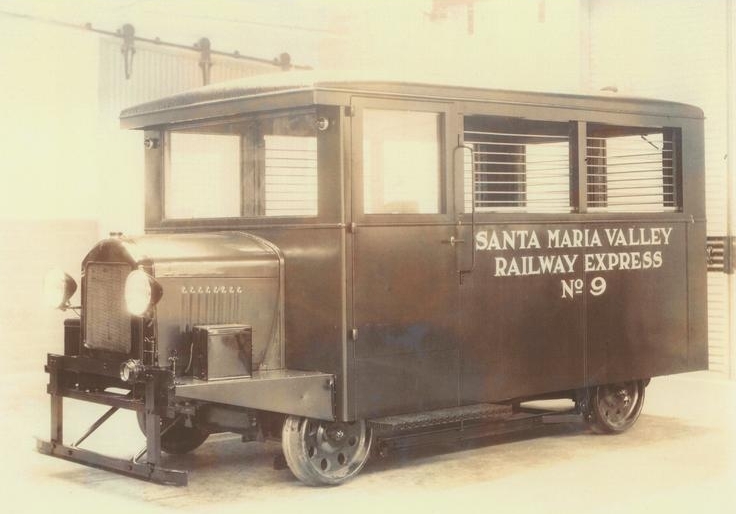 It ran on SMV's 18-mile line from a Southern Pacific connection at Guadelupe to Santa Maria & Gates Station,CA. SMV #9 never ran faster than 35 mph or carried revenue passengers, though it reportedly transported undocumented workers to pick vegetables & fruits. In strawberry harvest season, it often pulled one or two four-wheel trailers. SMV #9 also served as an inspection car and auxiliary section car. 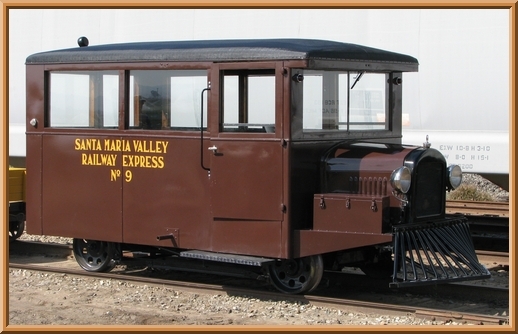 It was retired from regular service about 1936, painted orange, and used in some maintenance-of-way service until 1962, when sold because of excessive engine repair costs to the Valley Pipe & Salvage Company of Santa Maria for scrap. Its radiator, drive shaft, and some other parts were removed and sold. 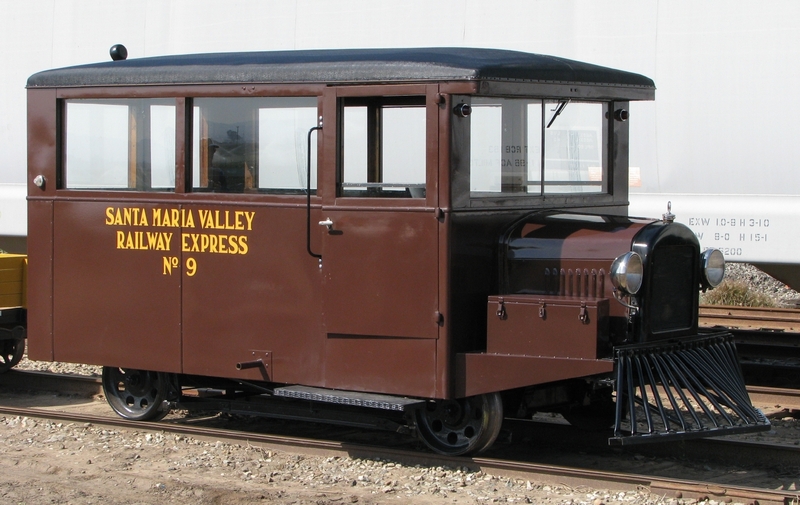 Following a museum request, SMV #9 was donated to the PSRMA by Valley Pipe & Salvage owner Sam Berkowitz in May 1965 -- its first piece of rolling stock! Trucked south, for 16 years it was stored and worked on in many PSRHA members' yards and garages in La Mesa, Lakeside, San Diego, and Spring Valley, until brought to Campo in July 1981, fittingly being the first piece of rolling stock at the museum's new home. Because many "unobtainable" missing parts had to be replaced or specially made and museum funds were limited, the railbus restoration was not completed until April 1991 -- 26 years after its acquisition! Painted orange with a silver roof in August 1967 when restoration was thought to be "80% complete", in 1991 it was painted Beaver brown & tan with black roof, pilot, radiator, & underframe with a lacquered wood interior. The railbus made its public debut from May 3-12 in Sacramento, at the California State Railroad Museum's RailFair '91, where it received much attention. It was also displayed August 8, 1991 at San Diego's Santa Fe depot. SMV #9 is now on exhibit in beautifully restored condition in the Museums Campo carbarn, and is occasionally operated.